This evening I headed over to Discovery Park to photograph the sunset with a few friends. 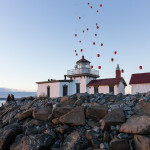 I stumbled upon an engagement shoot where they had arranged to release a bunch of lit balloons into the air. I set up my tripod, chose my composition and waited for the show. 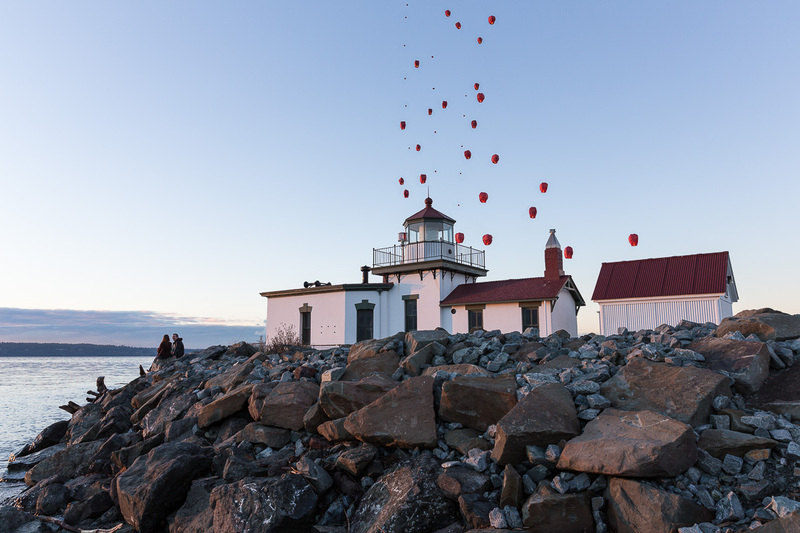 The spectacle was wonderful, and I came away with a unique shot at one of my favorite places in Seattle. I wish the happy couple a wonderful life together. You may wonder why there aren’t a bunch of people in my shot. The trick is to shoot from a tripod and take multiple exposures. As long as the light is similar, it’s a cinch to blend multiple shots together in Photoshop. Remember, people tend to move around. Open up the multiple exposures as layers in Photoshop and “mask” away the people. For example, if a person is standing at one spot on shot #1, and has moved to another spot in shot #2, create a layer mask and “paint away” the person from shot #1 to reveal the background from shot #2. Similarly, paint away the same person from shot #2 by replacing her with the background from shot #1. Thanks, Niki! This was completely unexpected. I was just getting ready for the good light when I started seeing these lanterns floating above the lighthouse. How cool is that! ?